Straight teeth are important for both dental health and cosmetic purposes. Crooked teeth affect the way a person smiles, chew, and talks. Crooked teeth can be harder to clean and be more prone to decay. They may also wear abnormally. Very crooked teeth can cause jaw pain and headaches. A beautiful smile may also play an important role in social and career success. Several studies have shown that in the U.S., people with straight teeth are automatically perceived as being more successful, trustworthy, smart, healthy, and attractive than people with crooked teeth. In the U.S., the current practice is to straighten the teeth of most children and adolescents. Parents are encouraged to take their children to see an orthodontist at age 7, when the permanent teeth are coming in. At that age, orthodontists can identify possible problems and assist parents in planning for future straightening work. Braces are very common among children age 9 to 14 in our society. Children are the preferred target for tooth-straightening because it’s easier to straighten their teeth as they are coming in. However, it is also possible to straighten the teeth of adults. This is good news for the many adults who have less-than-perfect smiles. Many adults grew up in an era in which orthodontic work was reserved for children with severe bite problems. Others had parents who could not afford orthodontic work. And others did wear braces, but didn’t wear their retainers afterwards and their teeth reverted to a less-than-straight form. Teeth are attached to the mouth by roots that are embedded in the gums and bone of the jaw. The attachment is quite strong, but somewhat malleable. The position of the teeth can be changed by slowly pushing them into a new position through the action of braces. Once the tooth reaches the desired position, if it is held there long enough it will “set” into the new position permanently. Invisalign for adults are clear plastic structures custom-made for each patient. They resemble a mouth guard or a tooth-whitening tray more than the conventional image of braces. The structure slips on over the teeth and stays there, applying gentle pressure to gradually push the teeth into a straighter position. Each patient gets a series of different custom-made Invisalign aligner trays that slowly and progressively straighten the teeth. The Southington Invisalign orthodontists examine the patient’s teeth and plan a series of intermediate steps that take the patient’s teeth from their current positions to a perfectly straight set of teeth using a special computer program. The necessary set of custom-designed aligners is created for each patient using a 3D printer. The patient wears each Invisalign aligner for about 2 weeks, and then switches to the next Invisalign aligner in the sequence to continue the gradual straightening process. Invisalign has many advantages over traditional braces for adults. The two most important are that they are invisible, and that they are removable by the patient. Very few adults are willing to go about their lives sporting visible braces on their teeth, and therefore the lack of visibility is an important aspect of Invisalign. The ability to remove the aligners at will means that patients can eat, drink, and clean their teeth normally during the tooth-straightening process. Since it takes around 12 months to straighten the teeth of an adult, this is a very good thing indeed. The aligners need to be worn 20 to 22 hours a day to work properly, meaning that they need to be worn day and night except when eating and cleaning the teeth. Because they are soft, they can be worn during sports without fear of damaging the gums on sharp metal brackets. Alternatively, they can simply be removed during sports, particularly if they get in the way of wearing a mouth guard. The aligners are made out of a soft BPA-free plastic that is quite comfortable for most people to wear. A few individuals experience some minor gum irritation when they first start wearing their aligners, but this usually goes away after a few days. Occasionally, someone will discover that they lisp or mumble when wearing the aligner, but again, this usually goes away after a few days. Most people don’t even notice they are wearing the aligners. Sometimes the process of moving the teeth makes them ache or feel mildly uncomfortable, but this is an unavoidable side-effect of moving teeth. Individuals who wear conventional braces also occasionally experience this type of mild tooth discomfort. The aligners do need to be cleaned daily. They can be soaked in a special cleaner during mealtime or just brushed and rinsed before being popped back in. The aligners may melt if exposed to high temperatures, so it’s a good idea to not leave them inside a hot car. Patients need to visit their orthodontist every 6 weeks or so during the tooth-straightening process to ensure it is proceeding as planned. Occasionally, the teeth don’t move as expected and a different set of Invisalign trays have to be made to continue the process towards a perfectly straight set of teeth. After completing the process, most patients will need to wear a retainer at night for several years to ensure their teeth remain straight. The teeth will eventually set permanently into their new, beautiful smile, but until then, retainers help keep them in place. The retainers are comfortable devices made out of the same plastic and technology used to create the Invisalign aligners. 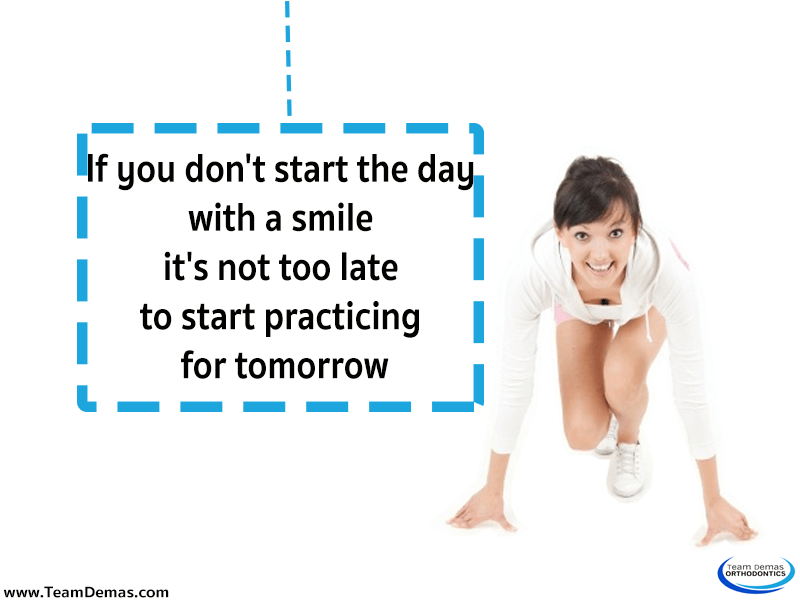 Why not start today to get that new smile you’ve always wanted? Make an appointment with the experts on adult Invisalign in Southington. Call Team Demas Orthodontics today!